This fisherman's cart parked along the wharf in Amalfi, Italy drew my eye one early morning just as the sun rose over the sea. 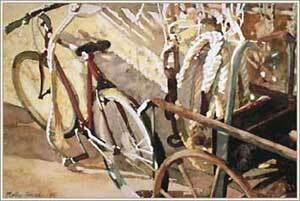 This piece was selected to be in the book of Best of Watercolor Painting Composition, published by Rockport Publishers, Rockport, Mass. in 1997.